I have absolutely no idea what to write about on the blog today, which is quite perplexing. I don't usually suffer from writer's block. I'm utterly and completely stumped about what's going on. I often have two or three weeks worth of blog posts written ahead of time and scheduled to post automatically. There will be certain days where I'll get into a groove and write a whole mess of posts. The words flow and flow and flow. It might not be any good, but the words flow nonetheless. My process is an internal one - I usually have a list of blog topics and "write" posts in my head, often before I drift off to sleep. By the time I get to the computer, they're pretty well formed and I just quickly type them up (which accounts for all the typos!). But lately - nothing. Nothing is going on in my head. Obviously, stuff is going on in my head, but nothing worth writing about. It's the kind of stuff that would bore you to tears. Or you might wonder why they don't up my medication. You gotta love the internet - any problem you have, the internet has got an answer for. While I was drinking my morning coffee, I asked the internet two questions: (1) what do I do about writer's block and (2) how much do taxidermists get paid. I didn't really find out the answer to question #2, but I spent a good hour going down some fascinating rabbit holes. And of course, along the way I saw a lot of stuffed rabbits. Even one with wings. Bizarre. When it came to question #1 about writer's block, I found an article which promised 27 Wacky Ways to Beat Writer's Block. I like wacky, which of course you already know given the fact that I spent a good part of the morning asking the internet about taxidermy. Unfortunately, the tips weren't all that wacky. There was one that said you should curse like a sailor. Considering I live on a boat, I thought that was intriguing. I don't usually swear, but I gave it a go. It didn't really work for me. Plus the cat I'm kitty-sitting (Georgie the Sailing Cat) stared at me like I was nuts, so I felt kind of stupid. Some of the other tips weren't really up my alley - like wash the dishes (boring), stop worrying about grammar (I leave that one to my mother) and drink coffee (I already had a cup in hand when I read that one). Eventually, Georgie said to me, "Enough is enough already! Who cares about your stupid blog! Take me for a walk!" Okay, it sounded more like, "Meow! Meow! Meow! ", but I got the hint. After our walk (which was more like a let me eat some grass, fall down on the pavement and let you carry me around kind of walk), Georgie told me to just write some rambling nonsense on the blog, hit publish and spend the rest of the day paying attention to her. So, I did. Hope you enjoyed the rambling nonsense. If not, here's a couple of pictures of Georgie instead. Georgie sitting on our boat and checking out what's happening at the marina. 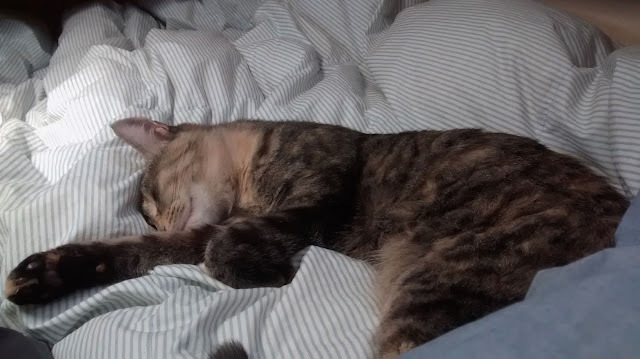 Georgie making herself at home. About the only good thing that can be said about hurricanes is that thinking about whether one might come your way sure does take your mind off the alligators that swim near your boat. Since we became boat owners, I've found that I have a new interest in hurricanes and cyclones. (Hurricanes and cyclones are the same thing, what they're called depends upon where they start.) I'm usually far more interested in chocolate chip cookies and reading books, but when you start to hear the words HURRICANE and CYCLONE in the weather report and they're pointing at where you and your boat are, I forget all about cookies and books. My first experience thinking about cyclones was when we were in New Zealand. New Zealand is relatively safe from cyclones (although they do happen), which is why people overwinter there from the Pacific islands, but it can feel the brunt of ex-cyclones which still have hurricane or tropical storm force winds. We rode out two of these at Westhaven Marina in Auckland when we were full-time cruising there in 2014. Everything turned out fine both times, except for the computer, which is a long story and makes me look bad. You can read more about it here. Now that we're back in the States in southern Florida on our new-to-us boat Tickety Boo during hurricane season, guess what I'm thinking about. Yep, hurricanes. First, there was Danny. Fortunately, Danny fizzled out and wasn't forecast to hit Florida. Now we have Erika. Erika is looking to be a whole different story. I started to really pay attention to her on Wednesday when the forecasts came out showing her set to track into Florida. Where in Florida is anyone's guess. 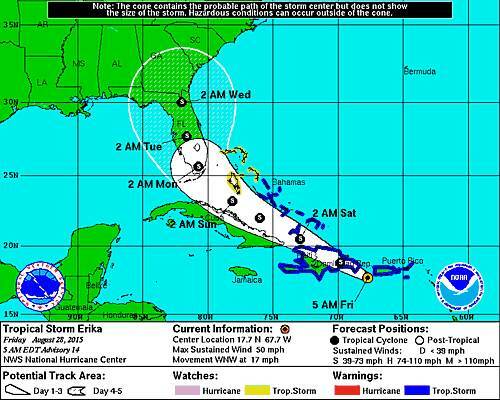 My favorite description is that Florida is in the "cone of uncertainty." We're living aboard our boat in Indiantown Marina during hurricane season (actually, I'm the only one on it now while Scott's in Scotland). One of the reasons we chose to come here was that Indiantown is supposed to be a hurricane hole. It's located far enough inland on the St Lucie canal near Lake Okeechobee that it should be safe from most hurricanes. Except when it isn't. Then boats get damaged and some even fall over. Lots of people store their boats on the hard here and they strap them down to the ground to keep them from blowing over. It's similar to what people do with RVs. Boat US describes what Indiantown Marina does in this article here. 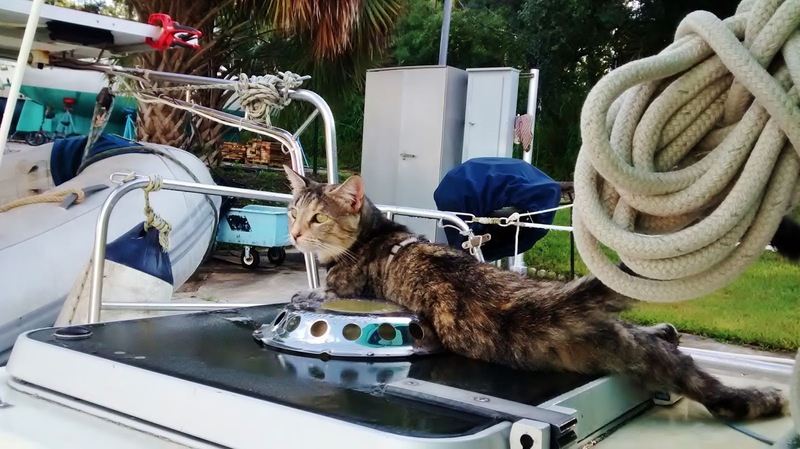 We have some tie-down straps, but right now our boat is in the water and if we need to do hurricane prep, it will be about making her as safe in the water as she can be. Even if we wanted to get hauled out, we might not be able to. Indiantown Marina has a "Hurricane Club" - for $250, they'll guarantee that you'll get hauled out. We didn't pay the $250, so we're way down in terms of priority. The ladies in the office told me they've been getting a lot of calls about people wanting to haul out or lay up in a slip and we've been seeing more boats come over the past couple of days. I'm guessing we may see a fair few boats make their way to Indiantown, especially before they close the locks. Along the Okeebhobee Waterway, 72 hours before a tropical storm or hurricane makes landfall, they keep the locks open from 6:00 am to 10:00 pm to allow boats to make safe harbor. Eight hours before landfall, they close the locks, and move the railway bridges and drawbridges into a locked position. Things you have to think about if you're not already inland. As if there wasn't enough to think about with a hurricane looming! As of 5:00 AM this morning, the National Hurricane Center is showing Erika tracking west-northwest and heading into Florida early Monday morning. Yesterday, the track was along the eastern coast of Florida, today it shows Erika heading inland. Erika seems to have a mind of her own and things are still quite uncertain. I'll be keeping an eye on things and be starting in on hurricane prep as needed today and tomorrow. 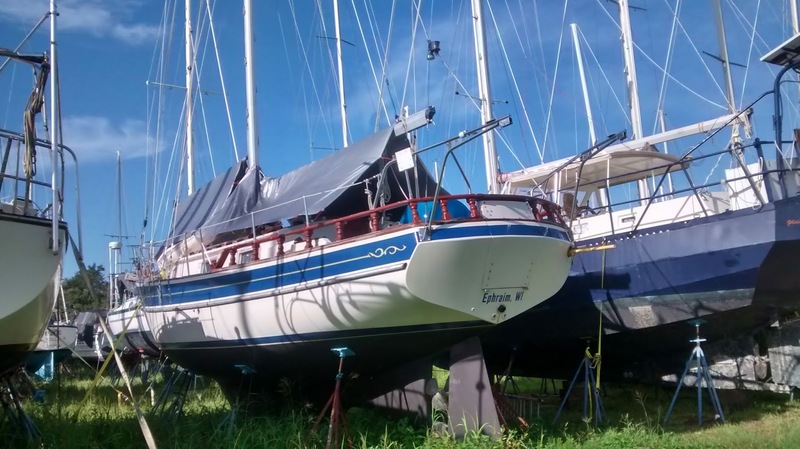 We already took the sails down, but I'll need to remove the dodger and bimini to reduce windage. I'll also drop our dinghy from it's davits and secure it. Then it will be time to add extra lines and get some chafe protection in place and all sorts of other fun stuff. Good times. If you want to know more about hurricane preparation, check out what Carolyn at the Boat Galley has put together. Have you ever been in a hurricane? What kind of prep did you do? What do alligators think about when a hurricane is coming? Our boat has had four names in it's lifetime - What a Day, Y-Knot, Moody Blue and now Tickety Boo. 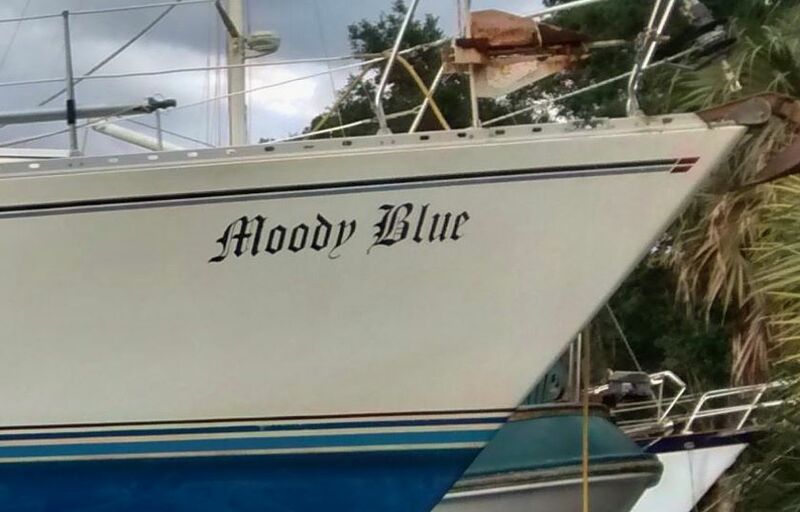 In some ways, it seems odd to change a boat's name. After all, you wouldn't adopt a child and change her name. You might change a baby's name, but imagine saying to a seven year old, "From this day forward, your new name is Esther. Start getting used to it! Now, sit up and eat your peas. They're good for you." Our boat is even older - 28 year old to be exact. She wasn't too impressed by the fact that we changed her name - again. In fact, when we told her we were going to change her name, suddenly the windlass started acting up. I think it was her way of letting us know that she was struggling to embrace this whole name change nonsense. Even 28 year olds have been known to throw a temper tantrum from time to time. But then, we sat down with her and told what her new name meant. 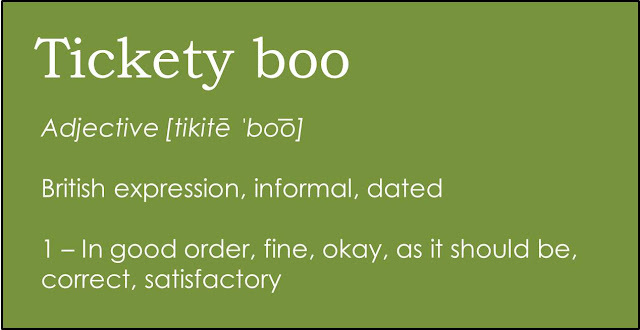 Tickety boo is one of our favorite New Zealand expressions. We love living in New Zealand and wanted a little Kiwi touch on our new boat. We explained that it's a British expression meaning that "everything is all good". Which is exactly what you want on a boat - for everything to be all good. After that, she got onboard with her new name. The windlass still doesn't work, but I think that's because she's a bit miffed about the color I chose for the slipcovers for our settees. To be honest, I don't like it either, but I don't go around breaking things on our boat. Let that be a warning to all of you buying fabric online. The color never quite matches what you saw on the computer. I'm not sure what the true origin of tickety boo is - there are a lot of different stories out there. It could have come from the Hindi expression, "Tikai Babu", meaning "It's alright, Sir" or it could be a shortened version of "That's the ticket." Whatever the origin, it's got a nice meaning and it's fun to say. Go on, say it aloud - tickety boo. Kind of makes you smile, doesn't it? When I tell people the name of our boat, I get one of two reactions - "Oh, how cute!" and "Wow, your husband must really love you to let you name your boat that." Considering most Americans have never heard of the expression, it certainly generates a lot of questions about what it means. 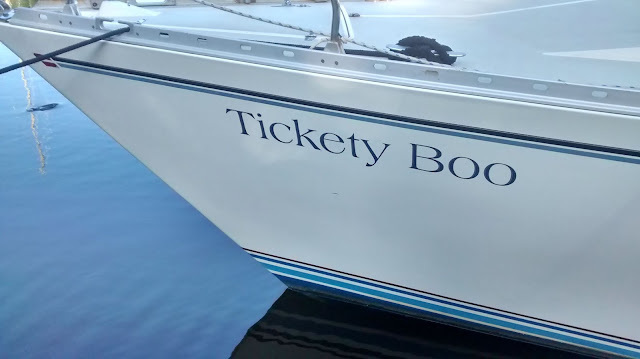 When we picked up a mooring ball at Sunset Bay marina in Stuart, Florida, the guy that checked me in said he never asks people about their boat names, but that he just had to ask what the heck "Tickety Boo" was all about. Guaranteed conversation starter! 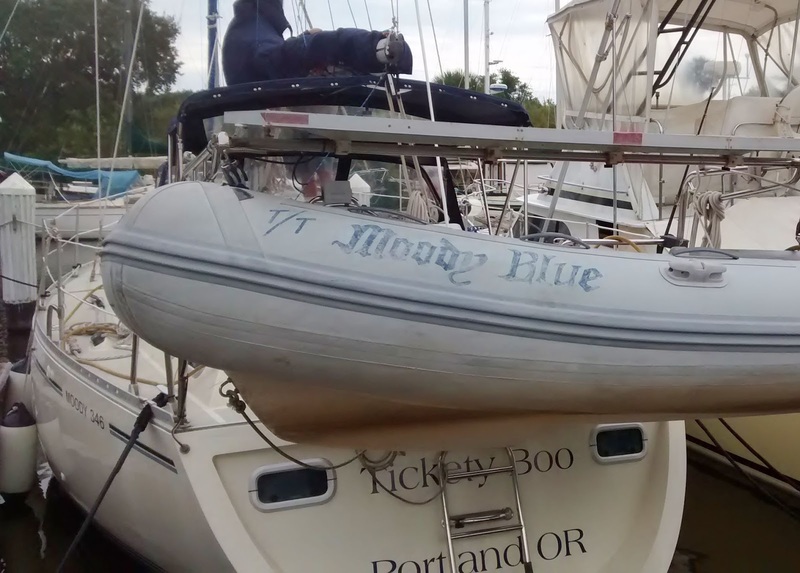 One of my tasks when we bought our boat in April, was to take off her old name and put on the new one. Here's what she looked like when she was called Moody Blue. The font suited the name Moody Blue, but it was a bit too ornate for a name like Tickety Boo. It was actually a bit too ornate for us. We're casual kind of people and we needed a casual font to reflect that. After getting checking out a few recommendations on where to get boat lettering and comparing prices, I went with DIY Lettering. You can type in your boat name and hailing port and check out what it looks like with various fonts and sizes. I ended up going with Americana, which is kind of ironic given we were naming our boat after a New Zealand expression. Here's what it looks like on the bow. Taking off the old name and hailing port was pretty straightforward. I just got a plastic scraper, some water and scraped away. Everything came off pretty easily on the bow, but was a bit tougher on the stern, but eventually persistence won the day. A bit of sanding to buff out some of the shadow lettering left behind and we were good to go. It was a bit trickier to put the new name and hailing port on. In exchange for $83.91, DIY Lettering sent me what are basically giant decals. You perch precariously on a ladder, tape the lettering on, make sure you're happy with how it is positioned, remove the liner underneath which sticks your lettering onto the boat. When you peel off the transfer tape on top, presto, you have a new boat name. The next step is to stare at it despondently while you realize how many air bubbles there are which have made things a bit kitty-wampus. Oh well, too late. You're stuck with it. But not to worry, just remind yourself that everything will be tickety boo. Have you ever named a boat, an RV or even your car? What name did you choose and why? When I quit corporate la-la land, I left behind high heels, clothes that need to be ironed and endless meetings about budget allocations and headcount. I also thought I left behind PowerPoint presentations. I figured when we moved onto our boat, the ability to create diagrams, insert pictures, add labels and format text boxes really wouldn't be all that important of a skill. Tying a bowline - important. Making a PowerPoint presentation - not a high priority. Turns out I was wrong. All those years working away in a cubicle in my own personal Dilbert cartoon have finally paid off. Now, I find myself using PowerPoint to document all the systems on our boat. I'm as surpised as you are. They aren't the prettiest presentations I've ever made and, trust me, I used to make some pretty slick presentations in my time. But they're functional. And when you live on a boat, you quickly learn that function is far more important than aesthetics. After all, wouldn't you rather have a boat that floats, rather than one that has fashionable throw pillows? One of the things I've slowly been doing over the past couple of months is getting to know our boat and figuring out what everything is. Although Tickety Boo came with a Moody 346 manual, it's almost 30 years old and doesn't reflect the changes that have been made to the boat since then or provide all that much detail. One of the fun things about boats is that they have all these tiny little spaces hidden away beneath the floor, in cabinets, under the bed and settees. Everytime you open one you're presented with exciting little mysteries to solve. Like what the heck is that pipe for? Where does that wire go to? 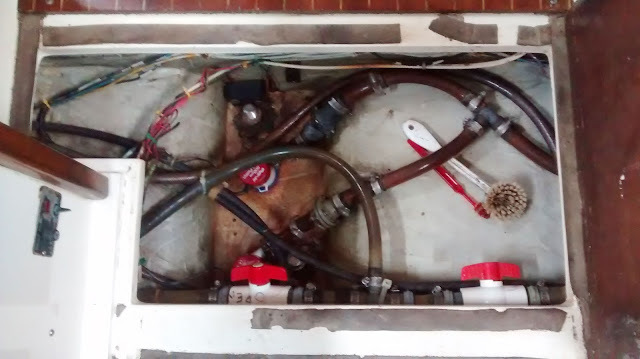 Where is the water in my bilge coming from? Here's what you see when you lift up the floor in our saloon (aka living room). Once I opened it, I sat down and stared at it for hours, utterly confused by the the various hoses, pipes and contraptions. Okay, maybe I didn't stare at it for hours - my attention span certainly isn't that long. 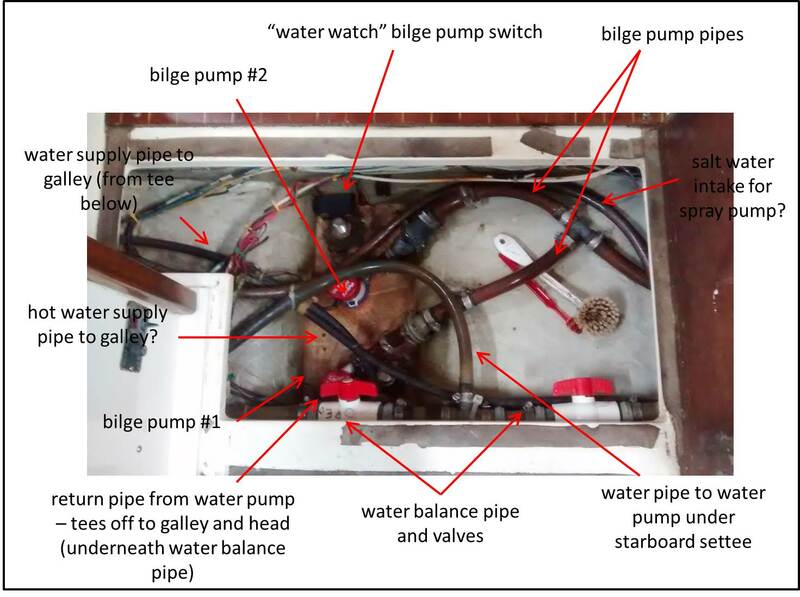 Eventually, I traced the various pipes and hoses to other parts of the boat and identified the various bilge pump equipment. Then I made a handy-dandy PowerPoint diagram so that we would have a visual reference going forward. We've also got lots of mysterious vents. Well, mysterious to me. Scott knew what they were. 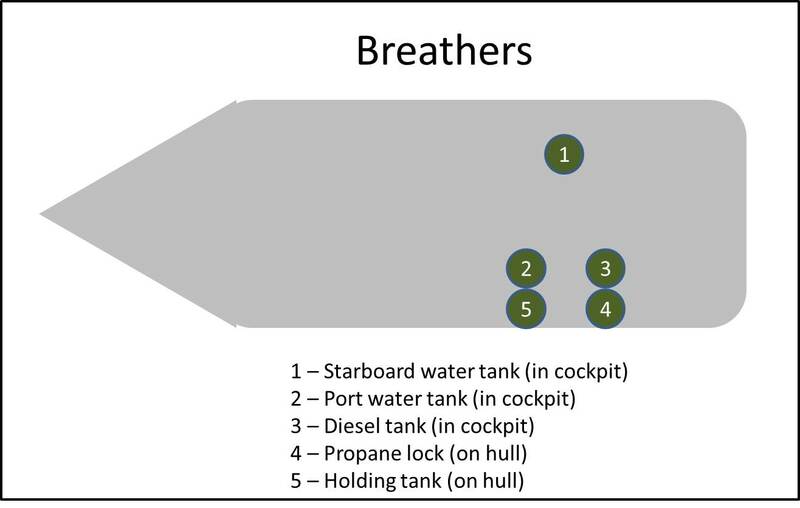 Turns out they're called "breathers" and provide ventilation for our water tanks, holding tank and propane locker. We didn't have these on our last boat. There's days that I miss our old boat - it hardly had any systems at all and was much simpler to understand. Then I remember it was so small that Scott had to sleep on the settee because there wasn't room for both of us in the v-berth. There's something to be said for larger, more complex boats. 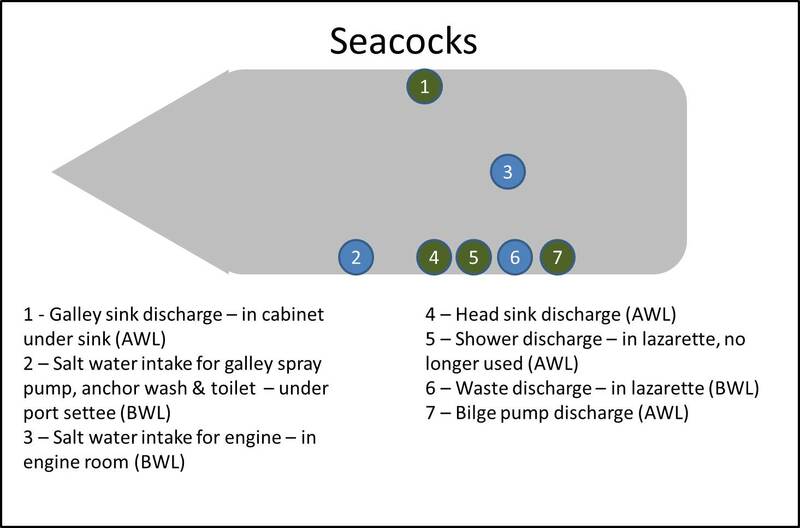 I've also been making diagrams of our thru-holes and seacocks. I get a little unnerved by the fact that we have holes above and below our water line, but what can you do? The water from your sinks needs to go somewhere. Same for the waste from your blackwater tank. And, as counter-intuitive as it may seem, you actually need a way to get saltwater onto the boat for the engine, to flush the toilet and to wash off the anchor. As frustrating as it can be to figure everything out at times, it sure beats wearing clothes that need to be ironed and sitting in an office everyday! Compared to most Americans, we live in a pretty tiny house. The average size of a house in the States is probably somewhere around 2,000 sq ft (610 sq m). Our house is less than 400 sq ft (122 sq m). Our house also has one other big difference from most American homes - it's on the water. Yep, we live on a boat. A tiny boat. Do you know what happens when you live in a tiny boat? Your doors are ridiculously small. You would think I wouldn't be too surprised by this. After all, we spent some time living on an even smaller boat, which was probably less than 250 sq ft (76 sq m). And we lived in a tiny Scamp travel trailer which only had enough floor space for one person to stand up at a time. Compared to our first boat and our travel trailer, our current boat is enormous. Except for the doors. Do you know what I've learned from my ridiculously small doors? 1 - I need to wear a helmet. 2 - Measuring things is important. Take the door to our bedroom in the aft cabin. It's only 46 in (117 cm) tall. Just take a minute and have a think about how tall you are. Chances are, you're taller than our door. 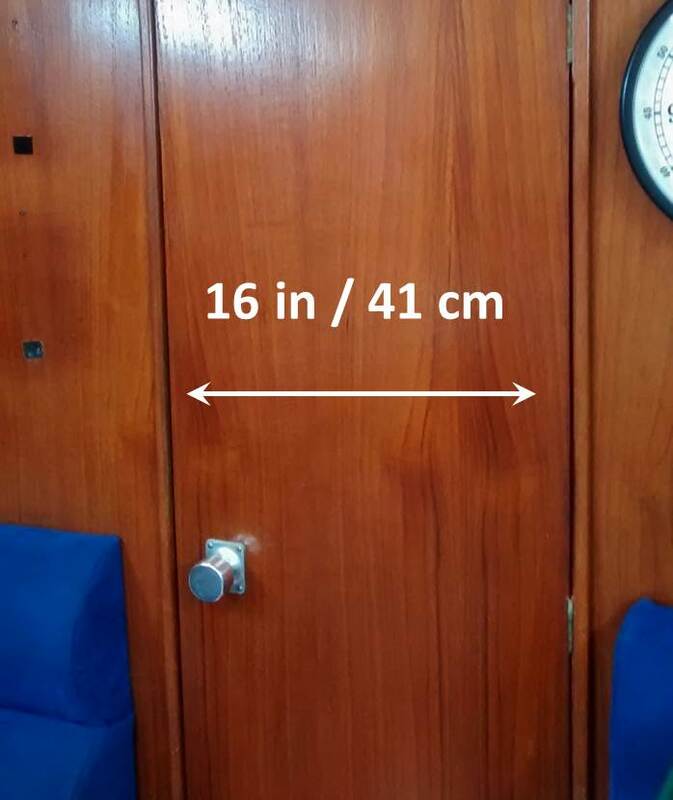 A normal sized door is around 6 1/2 ft (2 m) tall. They're designed to fit normal size human beings. Ours is designed for hobbits. Scott is 6 ft (1.8 m tall). The contortions that he has to do to fit through the hobbit hole are pretty funny. I'm 5 ft (1.5 m) tall and don't have to bend down as much, but pretty much every single time I go through the door, I bang my head. You would think I would remember to duck more, but I never do. I really need to start wearing a helmet. And then there's the door to our v-berth (the cabin at the pointy end of the boat). 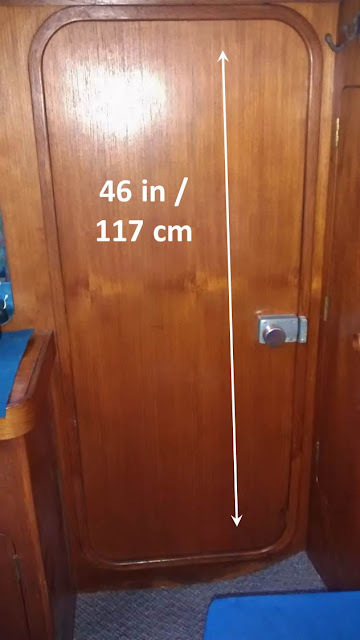 It's taller than our aft cabin door, but it isn't very wide - only 16 in (41 cm). A door you'd find in a normal house would be around 30 in (76 cm) wide. This is where measuring comes in. I recently bought a new Sailrite sewing machine, but I was too cheap to buy the carrying case. Instead, I went and got a plastic storage container at Walmat to put the Sailrite in so that we can store it in the v-berth when we aren't using it. I measured the Sailrite carefully and got a container that it would fit in. 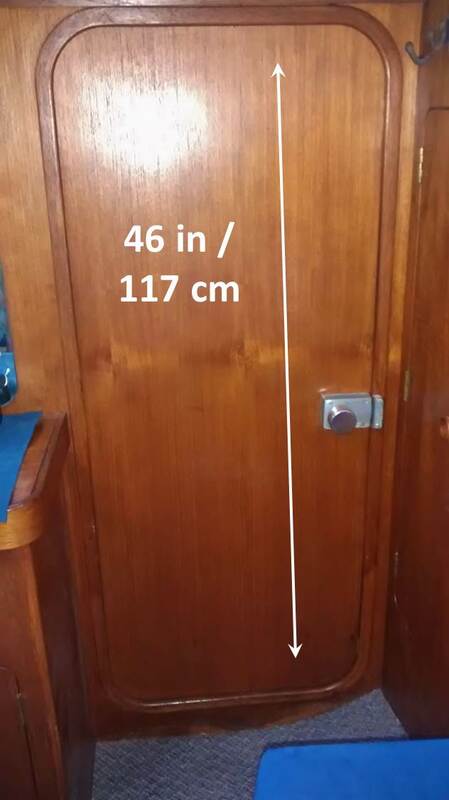 One problem - I didn't even think about measuring the door. Wouldn't you know it, the storage container was too big to fit through the door, not matter which way I turned it. I guess I still need to do a lot more tiny house / boat living before I get used to our ridiculously small doors! If you want to see more pictures of our tiny boat - click here. Do you live in a tiny house or boat? How big are your doors?